I have to admit, when I saw Chicago on the 2017-2018 Hennepin Theatre Trust tour schedule, I was not excited. It's made the rounds many times in the last 20 years, and I'd rather see something new (like The Band's Visit, please!). But as the date rolled around, I realized I hadn't seen Chicago in six years. And since the 1996 revival is currently the second longest running musical on Broadway, it's not likely to be released for regional productions anytime soon, so the tour is my only chance to see it. I went to opening night, and I loved every minute of it. It's been a long time since I've even listed to the score, so I forgot what an all-around brilliant show this is. 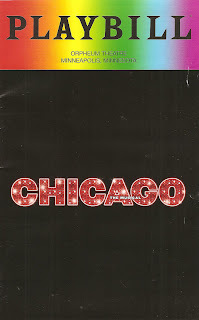 The clever and jazzy score by the genius team of John Kander and Fred Ebb, Bob Fosse's iconic and positively thrilling choreography (reinterpreted by Ann Reinking for the 1996 revival, in which she also played Roxie), the ever more timely book (by Ebb and Fosse) that shines a harsh light on our culture's obsession with violence and celebrity, the incorporation of the 14-person onstage band into the story, and the seemingly endless supply of gorgeous and talented actor/dancer/singers who can not just inhabit these now familiar characters, but make them their own. 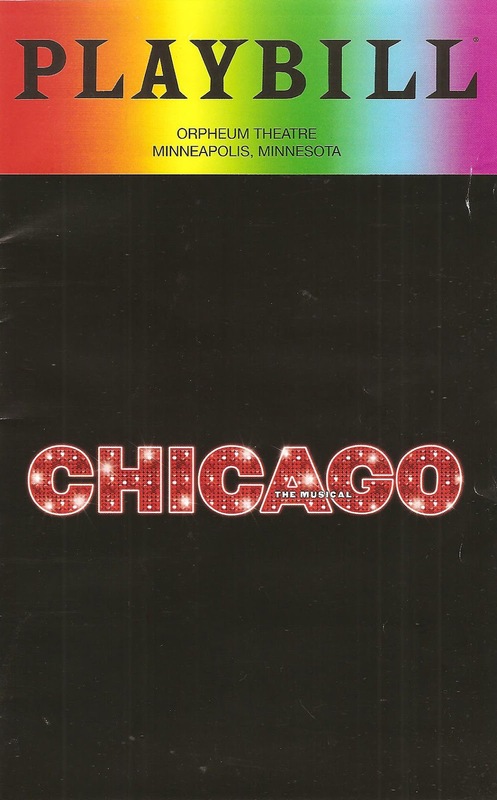 If it's been a while since you, too, have seen Chicago, or you have (gasp!) never seen it, now (meaning this week only) is the time. Chicago never gets old. Our two anti-heroines in 1920s crime-riddled booze-filled Chicago are Velma and Roxie, two murderers awaiting trial. Their story is told through a series of vaudeville-style vignettes, performed by the sexiest and best dressed prisoners you've ever seen. Velma and Roxie are at odds for most of the show, competing for the attention of slick lawyer Billy Flynn, the public's love, and a trial date. But after they literally get away with murder, they find that their 15 minutes of fame has disappeared, and they finally join forces in the fiercest act yet. This touring cast is absolutely phenomenal. So sharp and in sync, the ensemble members perform this choreography to perfection. You can't take your eyes off any of them. Terra C. MacLeod embodies Velma to the fullest, no surprise since she's played the role many times in many companies around the world (she also played Velma in the 2012 tour seen at the Ordway). She's well matched in Dylis Croman's Roxie, the more naive and bubbly one. Both actors make these roles their own and make interesting choices throughout that show no sign of fatigue with the material. As Billy Flynn, Jeff McCarthy is an oily charmer, and I couldn't figure out where I recognized him from until I looked him up and remembered he was the Guthrie's Henry Higgins a few years ago. What a delight to see him on #TCTheater stages again! Other highlights in the cast include Jennifer Fouché's tough Mama Morton, Paul Vogt's sweet hapless Amos, and D. Ratell with an impressive and surprising (at least for those new to the show) performance as Mary Sunshine. The set is relatively simple and is dominated by the bandstand, housing 14 musicians (most of whom are local for this production, making me wish I hadn't given up the clarinet). I love it when the band is highlighted and celebrated, and when I'm able to see them (when I can tear my eyes away from the dancing, that is). The show is performed in the space in front of the bandstand and on both sides, where the ensemble often sits when not performing, like they're waiting for their cue just offstage. Well not like, they are. This production is just so clever, it's no wonder it's such a huge success. It makes me wonder what the original was like that it only ran for two years. Likely it was ahead of its time, and the late 20th/early 21st Century is more receptive to, or needing of, its message. Chicago has a lot to say about celebrity, violence, and women's power, all wrapped up in a gorgeous and thrilling package of music and dance. It plays at Minneapolis' Orpheum Theatre through this Sunday only. And while this is definitely not your last or only chance to see Chicago (it's not going anywhere), it's always a thrill. There's truly nothing like it. Despite being a 20-year-old revival, Chicago is still an original.